This S*it is Bananas, B-A-N-A-N-A-S! Me love banana bread long time. My mom’s tattered index card recipe was always my favorite. That or Cousin Jen’s/Aunty Sandy’s version. Then I saw the weekend getaways show when Giada went to my favorite city – Boston – and scored a secret family recipe from Flour’s bakery. I have been making it ever since, for the last 6 months or so. But each time I made it I used sour cream instead of creme fraiche (it lists either on the recipe) because I live in Lemoore people, and we are not classy enough to have creme fraiche. We are lucky we even have wine here that is not in a box or doesn’t say boone’s farm on it. I digress… anyhow, we got a cool new chain here called Fresh and Easy and they have all sorts of gourmet goodies that make a foodie like me quiver! When I found Sopresatta (favorite salami from when we lived in Sicily) there I almost cried. So one day when I went browsing in there to get one small thing and came out $50+ later, I saw it, calling me. The angels were singing and I swear I saw a spotlight over it. Creme Fraiche said the package, hmm I wonder what it is. It looks like sour cream but smells sweeter. As I mentioned before I will research this more in another blog. So I tried the Flour’s Famous Banana Bread recipe again, this time with the creme fraiche and what the heck, some Ghiardelli milk chocolate chips. If you have not discovered Ghiardelli chocolate chips in any form yet, please do. Splurge, it is well worth it, they are like giant discs of pure heaven that can make any recipe seem fancy or tastier. So my banana bread must have been da bomb because Campy and I finished almost the whole loaf in a single night. I swear I gained 4 pounds by morning. What is that old expression – fat and happy – well that was me. So if you like banana bread try this recipe, if you are scared of the fancy french sounding cream, stick with the sour cream, but either way, you will never taste banana bread like this again! So tonight I made some dessert to bring over to a friends. I really wanted to try Alton Brown’s brownie recipe for like forever now, so I said what the heck, I’ll give it a go! Anything with 2 sticks of butter, 2 cups of sugar and 4 eggs must be good in my book. I love his approach to cooking, sort of a Mr. Wizard meets Julia Child. He has such a scientific approach and his method teaches even the novice cook the reasoning behind what makes stuff work. If you are not a baker I suggest you try one of his recipes as they are technical and hard to mess up. Anyhow, I whipped up this concoction rather quickly and got it ready to bring to our neighbors. The initial direction of “beat the eggs until they are light yellow and fluffy” sounded vague, I mean give me a time on how long this should take dude?! But they came out perfectly. The only thing that could make them any better was some killer frosting. I have some leftover creme fraiche from a recipe I made last week (will post that one later, it was good too) and I sought out a recipe that had this as the ingredient. 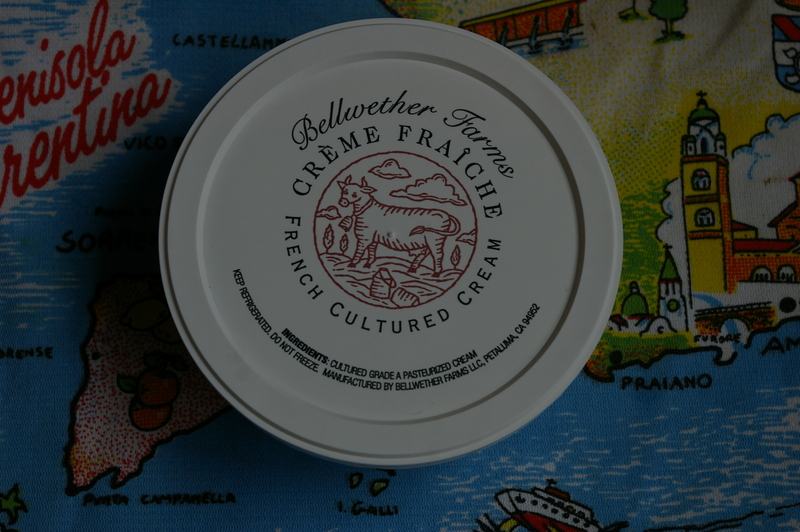 I’m not sure what exactly creme fraiche is, I will have to research that one later and give you all the scoop, but I hear it called for quite a bit, like its companion marscapone. I found some love cake Giada was making for her hubby and scrolled down to the frosting part. I used her frosting with a few modifications (like no rasberry jam, added some half and half and vanilla) and it came out to this creamy buttery yum yum frosting, think carrot cake cream cheese frosting but 10 times better with the creme fraiche! I am so glad I experiment in the kitchen because it almost never turns out badly. Our hosts loved the brownies and even the picky G tore em up. Try these if you want to eat something so sweet your teeth will hurt for days after. You are currently browsing the What Tara's Cookin' blog archives for April, 2010.